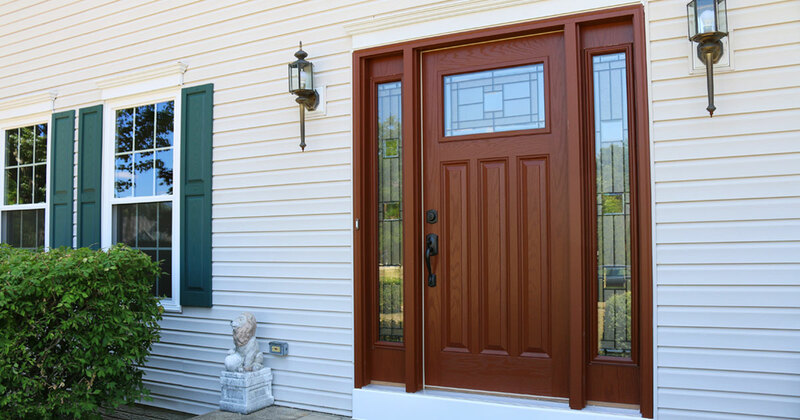 What Color Should You Choose for Your Entry Door? Your front door is the most welcoming part of your home’s exterior. Choosing the right paint or stain colors for your front door is critical for setting the tone for your home—and there are plenty of popular front door colors to choose from. Universal Windows Direct offers a variety of paint and stain options to enhance the look of your entry door. However, homeowners can also choose to order their new door primed and apply your own paint or stain. Red is a classic color for front door, with this trend containing both cultural and historical significance. During the Civil War, homes with red doors were traditionally believed to be “safe homes” for the underground railroad. Furthermore, a red door also signified as a safe place to stay for early American buggy travelers. A red door is believed to add energy and positive Feng Shui to your home. Similar colors from Universal Windows Direct include Wineberry and Bordeaux. Speaking of energy, bright yellow is one of the top choices to give your home when you’re looking to pack a punch with your curb appeal. Yellow expresses creativity of the homeowner, and it also symbolizes cheerfulness and fun. Turquoise might not be the first color to pop into your mind for an entry door, but it can certainly make a statement. Turquoise symbolizes emotional balance and stability, which gives your home a serene and calming appearance. Another calming color option for your front door is dark blue. Dark blue brings a sense of calm over your guests, and it’s also believed to bring positive energy into the home in terms of Feng Shui. This color also represents loyalty, trust, and stability. Classic blue is a great color option for homeowners looking for a dark blue door. Green is one of the most popular options for front doors. A green front door symbolizes that the homeowner cares about their home and community. The color green also is connected to nature, which can symbolize that the homeowner is grounded. Universal Windows Direct offers Forest Green as a front door color option, but there are many other shades that you can paint on your own such as pastel green and more. Picking the right color for your entry door will pack a punch on your curb appeal. Learn more about our front doors by downloading our electronic entry door brochure today.